Now where are the rest of my comments? This is a five star triple-A comic today. I know it went up a few hours late. But c'mon, we've got brand new guest star Dean (what's he wearing???) and Yellowbelly is a furry yellow monster dressed as a furry yellow monster, that's comedy gold. Let's get those comments rolling gang. I think I always post YAY on your blog. 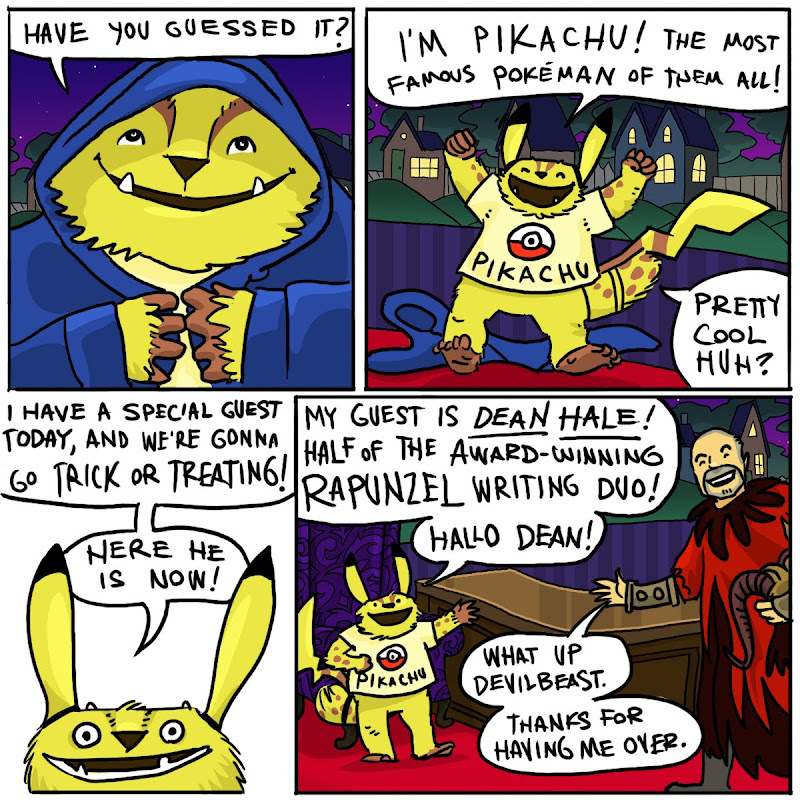 But Yellowbelly looks super cute as Pikachu, and I'm stoked to get Dean's interview. Good, good, excellent comment Nerd Goddess. Keep 'em coming everyone. Thanks for explaining Yellobelly's attire; I am at a loss when it comes to Japanese mind-control characters. I think I am going to get a mousy brown wig a pair of glasses and a padded suit and go as a school librarian. Should I know what Dean is dressed as - very handsome but a bit terrifying as well. I can't wait for the interview. I am really happy about the award not only on behalf of your own deserving self, but it is so amazing that we have this mush talent rocketing about our state. Yes, Utah has a its fair share of "Mush talent." Mush Talent will be the name of the arts segment on Otter News. It will be covered by the young hipster otter. Kortnry. She is not afraid to get down and silly with her featured guests, as she swishes her thick tresses out of the way of her microphone. There is a primetime news show that I watched while summering in Austria called "Innerhalb eines Fischotters" where the presenters were sock-puppets inside the bodies of what looked like freshly killed weasels. I'm sure that wasn't your plan for the format of the show, but I wouldn't want those guys coming after you. I really hope there is a time in my life when I can use the phrase "Summering in Austria", or for that matter " sock-puppets inside the bodies of freshly killed weasels". You're right, Dean. I definitely, DEFINITELY don't want anyone coming after me with dead weasels on their hands. Yes! Dean Hale! Ask him why Dreadcrumbs lies languishing in a dark abyss. Yay for Repunzel's Revenge! I'm excited for Dean's interview. It's so nice having talented, famous relatives. Fine, I guess I'll comment. HORRAH for Rapunzel! That's so exciting~! Hhhhmmm.... Mr. Hale looks like a viking. From the center of the earth, where everyone dresses in red and black. Yep. That's what I think. Whoa-- does Yellowbelly have TWO tales? Congrats on the award! Very well deserved! Alright! 15 comments (most of them my own...) thanks everybody, have a great weekend! Thanks Georgie K! I've never gotten a blogging award before! This is so exciting!